A few days after some bone-chilling weather, I decided I had to leave Taipei. My failure to enjoy Taipei made me want to go back to Hualien and reunite with my friends. Before starting my bike, I quickly put on my 25kg backpack, strapped the belt, and threw on my rain jacket. I did a couple of back-and-forth runs of Taipei to make sure I was completely comfortable before entering Route 9 or the provincial Highway 9, East Asia’s single deadliest road. No stalls, no nasty gear grinding, no forgetting what gear I was on, I was as ready as I was ever going to be. I filled up the tank and off I went. 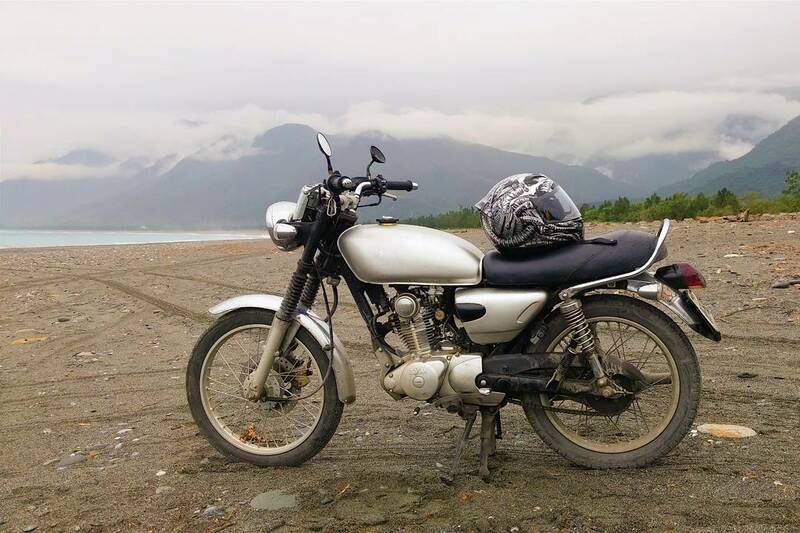 This was the challenge: to conquer the most dangerous road in Taiwan on my 2002 SYM Wolf. As I started ascending into the mountains near New Taipei City, the road became emptier and emptier, yet slower and slower. The speed limit is 40 km/ph in the mountains, but a motorist is barely capable of even slowing for the speed limit without slowing for a sharp corner. No one can make it at any faster than 30. By the 39km marker, the fog was so thick that I couldn’t see more than 4 meters in front of me. I kept the visor on my helmet up, despite the light rain, needing every centimetre of vision I had, and I stayed on the very right edge of the road. By the 80km marker, I was finally out of the thick fog. The sun was shining, but the roads were still wet. With some more visibility, I started pushing my limits around corners by doing minor trail breaking on the entries. Around a corner that I thought the apex, it suddenly got tighter. I tried to lightly hit both brakes but failed to touch my rear brake. Without enough stopping power, I ran my bike into the side concrete wall—the mountain side. A little nerve wracked, I returned to the roads. I rode slower than before, and with my foot on the rear brake, just uncomfortably flexing upward, so that I did not touch it unless intending to. Ugly as were the riding conditions, the views from this road were the most stunning I have seen in all of Taiwan. Yet, it was simply too unsafe to stop and to admire them. Luckily, after passing dozens of sharp corners, the roads started to straighten in Yilan County. I made it through pretty quickly, having far more confidence riding in traffic than before when riding in the mountains in Taipei. After a little while, the rain started again, not heavy, but not light, either. The next stretch of over 100km of road was Suhua Highway, a deadly, daunting road. I was entering it in the rain, as the light slowly faded away. Going around the corners on the wet chunder ground, I had the edge of my seat between my cheeks as I tried to keep as much of my weight in the corner, while keeping my bike as upright as possible. By doing that, I could eventually have my contact patch on the ground, avoiding a low-side from the wet loose ground. It was working pretty well. Overall, I was anticipating corners properly on the entirety of the route and did not lose grip once. However, by the worst part of the road, one truck which was moving in front of me almost killed me at regular intervals. I ended up with a handful of incredibly aggressive drivers behind me. A tour bus tailgated me. After 10 minutes of being the canter of this daunting sandwich and witnessing a car trying to overtake me, I found the truck in front of me hitting low-lying branches, making wood rain down on me. First, I almost speeded unsteadily into a ditch after running over a large branch. Then, I had a branch caught between my brake and footrest. Right when I thought the barrage of wood was over, a firedog-sized flew off the trailer compartment right towards me. I frantically swerved. It barely missed me head-on, but it did hit my hand, the side view mirror, and the right turn signal. My hand was saved by the knuckle armor on my motorcycle gloves, but my bike now had 2 safety measures broken. Moreover, it was dark, the skies were pouring rain, and the drivers were completely crazy. After another hour manoeuvring past the worst unlit section of Suhua Highway, I finally reached Hualien. However, the bike had no life left. No amount of kickstarting was getting her back. I had been blessed just enough life in her to get to Hualien, but no more. I was so concerned for my bike that I forgot about myself. After 6 hours of straight-up riding through hell, with 25 kg on my back, somehow my feet, hands, and mind came out unscathed. However, for the entirety of the road to Hualien, I do not have one kilometre of riding that I would feel regret about.